Tendons are the bands of fibrous connective tissue that connect muscles to bone. Tendons aid in movement of the fingers, hand and all other body parts. There are two types of tendons present in the hand- extensor tendons and flexor tendons. Extensor tendons present on top of the hand help with straightening the fingers. Whereas, flexor tendons that lie on the palm side of the hand help in bending the fingers. The flexor tendons are smooth, flexible, thick tissue strands which bend the fingers. Deep cuts on the under surface of the wrist, hand, or fingers can cut and injure the tendon and make it unable to bend one or more joints in a finger. When a tendon is cut, it acts like a rubber band, where the cut ends are pulled away from each other. Flexor tendon tears may be partial or complete. 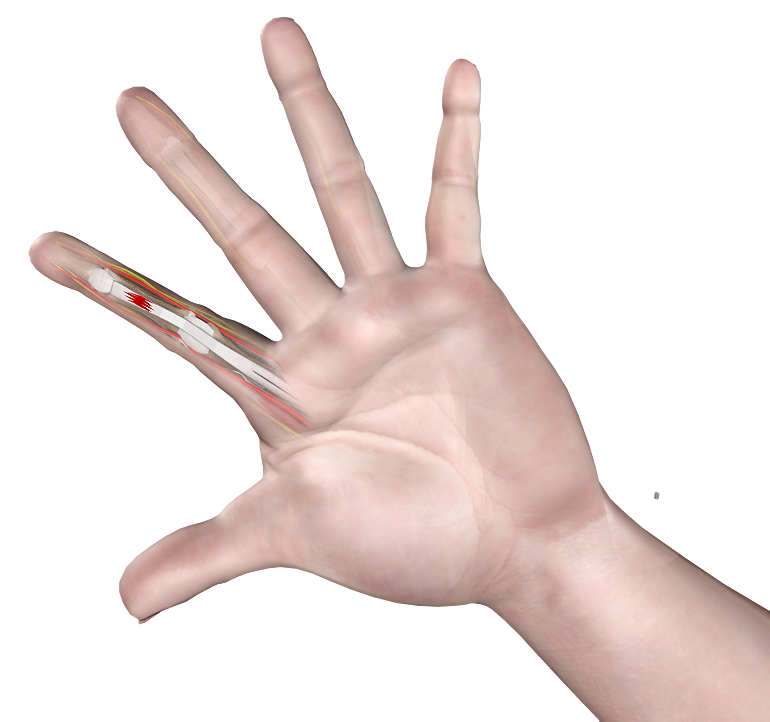 If tendons are completely cut through, the finger joints cannot bend on their own at all. Make sure to see a doctor when you sustain a finger injury that is affecting the flexion and extension of your fingers. First Aid: Apply ice immediately to the injured finger. Wrap a sterile cloth or bandage around the injury and keep your finger elevated above your heart level to reduce bleeding if present. A tetanus injection may need to be administered if not current. Your doctor will review your symptoms and medical history. A physical examination will be done, which includes a complete examination of both hands. During the exam, you will be asked to bend and straighten your fingers. Your fingers will also be checked for sensation, blood flow, and strength. An X-ray may be ordered to check for any damage to the surrounding bone. A ruptured tendon cannot heal without surgery because the cut ends usually pull away after an injury. There are many options to repair a cut tendon; the type of repair depends on the type of cut. The aim of the procedure is to restore normal function of the joints and surrounding tissues following a tendon laceration. The flexor tendon repair is usually an outpatient procedure and can be performed under local or general anesthesia. The surgeon makes an incision on the skin over the injured tendon. The damaged ends of the tendon are brought together with sutures to achieve a secure repair. If the tendon injury is severe, a graft may be required. A graft is a piece of tendon that is derived from other parts of the body such as a foot or toe. After the repositioning of the tendon, the incisions are closed with sutures and a dressing pad is placed over the surgical site. Your surgeon will place your hand in a protective splint to restrict movements. Depending on the injury, you will be advised to start hand therapy for a few weeks following surgery. This is to improve the movement of the finger. Follow your surgeon’s specific instructions for a successful recovery. Possible complications of surgery include pain, bleeding, infection, stiffness, rupture of the repair, and damage to the surrounding nerves or blood vessels. A second surgery may be needed to release any excess scar tissue that interferes with finger movement.